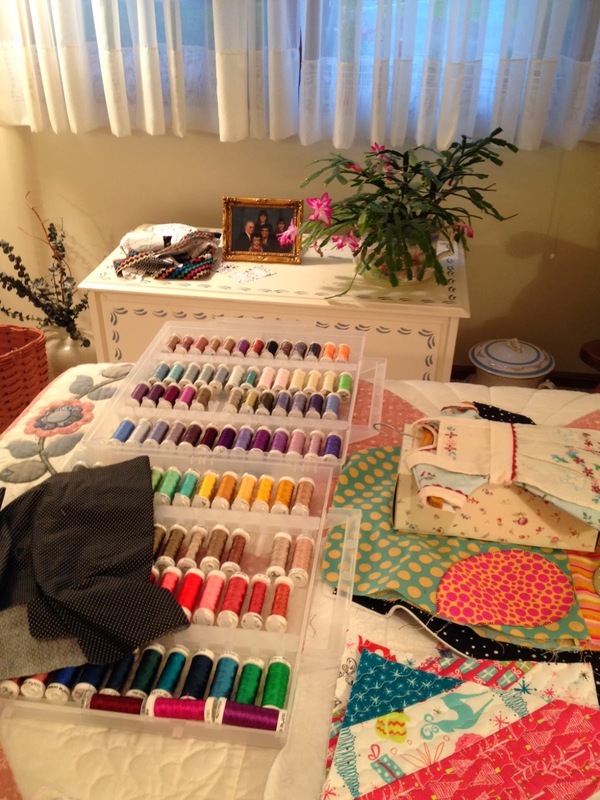 Here are some pictures of my sewing area - it would be so nice to have a studio but that ain't gonna happen and I really do manage fine most of the time. And it has been ever thus with me - when I am doing anything like this, everything kind of flies. I always seem to have to do lots of ripping out, also, since I am not careful about what is under my project when I sew. Eventually I get tired of that and do start to be more observant about what lurks underneath the piece I am working on. I have about five or six pin cushions on this side of my machine - love them all as they are all handmade and should be out where I can use them and see them. I can start out with everything in pretty good order--however, when I am working on something that is unplanned - that is, pulling different fabrics and interviewing them for a project--I can really get things muddled up. 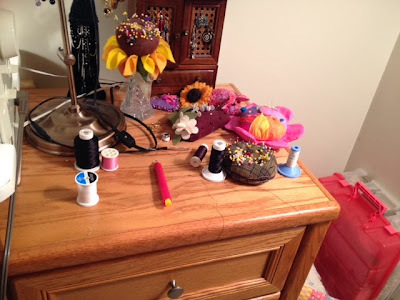 Thread flies, scraps fly and there is general chaos in my sewing area. 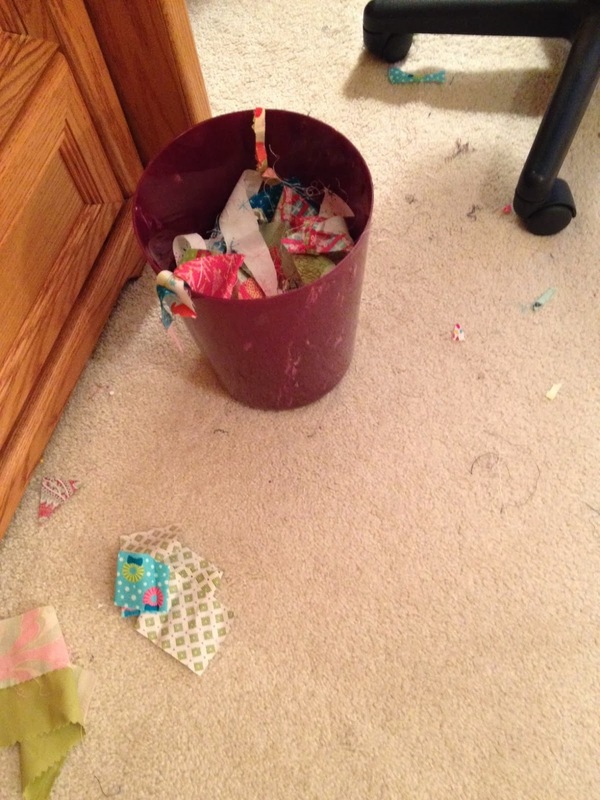 A few things hit the wastebasket but I do have to every so often pick up some of it and put it in where it belongs. My piles of fabric get to be a squirrel's nest and I can never find anything. 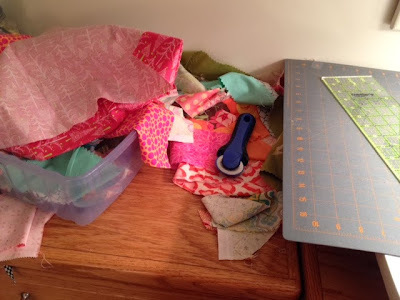 Seam ripper and scissors are the ones that elude me most of the time. I think I am getting worse as I get older. And the basement work area is just about as messy. Will have a day of putting things back to right again. This is the pile of projects that has caused this situation! 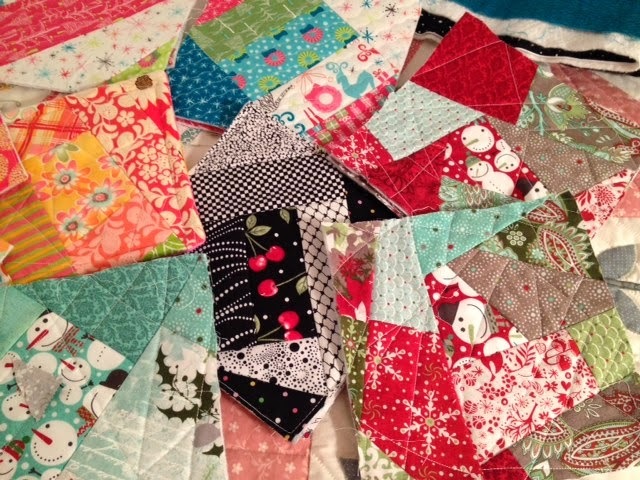 And I am enjoying working on them. A really bright spot in the room! My Christmas cactus is blooming. 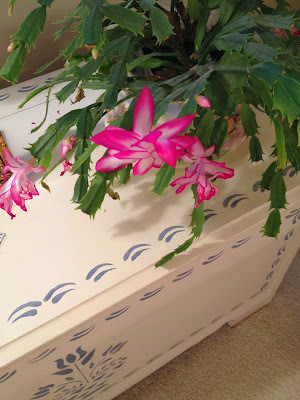 Usually it is a Halloween cactus and this year it is later and may be still blooming for Thanksgiving. The bloom is almost flourescent. Did I spell that right? 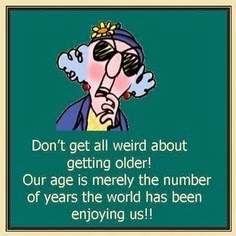 And now a word from Maxine! 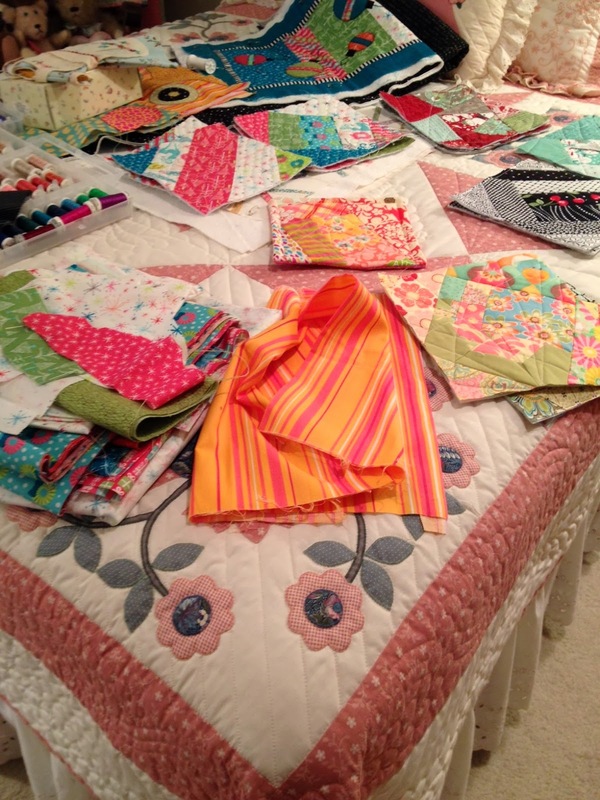 I think all quilters have this sort of pile. 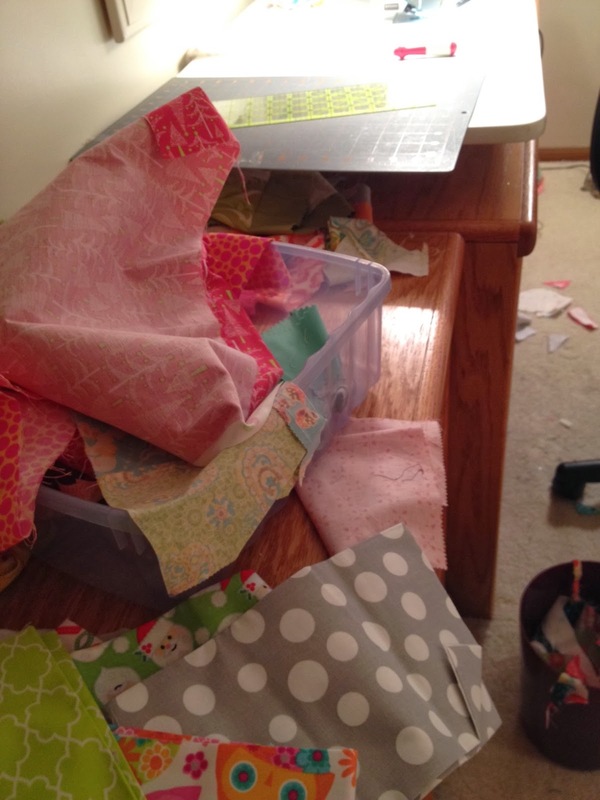 Mine is worse when I'm sewing a string project and trimming paper pieced blocks. I just work on them then get the broom and dustpan to clean around the wastebasket. Then I straighten the scraps and start over the next day. Too much fun! 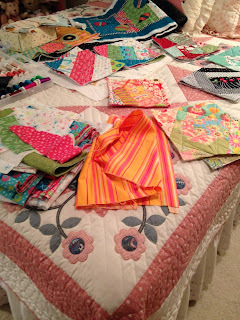 I only wish you were the messiest quilter. That dubious honor is mine. Oh, my, it looks like you are only a normal creative person, 'cuz I would have to say the same about me. I just am not posting my messes, lol! Oh boy I dare not tell everyone about your floss collection in the wonderful tin can. lol It's a creation alright. If I showed you pictures of my studio currently...I would win for most unorganized!